K&L Gates welcomes you to join us at the Infocast Wind Power Finance & Investment Summit. As a Gold Sponsor for the Summit, we are excited to have the opportunity to meet with you! The conference will be held on February 5-7 at the Omni La Costa Resort and Spa in San Diego, CA. Portland partner Bill Holmes will serve as the Master of Ceremonies for the Summit. 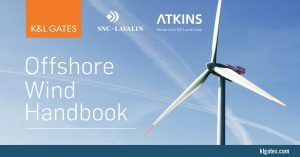 Stop by table 21 at the Exhibit Hall to meet our team and pick up a hard copy of our Offshore Wind Handbook. We will also have copies of the third edition of our very popular K&L Gates Energy Storage Handbook. K&L Gates is proud to sponsor the 2019 Infocast Wind Power Finance & Investment Summit. The Summit is widely recognized as the leading gathering place for wind industry deal makers. Each year, the industry’s leading developers, investors, lenders, turbine suppliers, EPCs and other players gather to gain valuable insights into industry trends, get the latest market update on the finance and investment landscape, and efficiently schedule rounds of private meetings. Bill Holmes will serve as the Master of Ceremonies for the conference. We are pleased to offer clients and friends a 15% discount off of registration. Please contact Lauren Hagerich at lauren.hagerich@klgates.com for more information..
A team of lawyers from K&L Gates advised German-based energy company innogy SE and its Chicago- based US subsidiary Innogy Renewables US on the acquisition of EverPower Wind Holdings from UK private equity investor Terra Firma Capital Partners. The companies signed the purchase agreement at the end of 2017, but the project has now successfully completed with approval from the Committee on Foreign Investment in the United States. Through the acquisition, innogy became the owner of more than 20 projects totaling in excess of 2,000 MW currently in various stages of development across eight states (Maine, Maryland, Montana, New York, Ohio, Pennsylvania, Washington, and Wyoming), giving innogy a strong foundation for expansion into the U.S., one of the company’s key strategic growth areas. innogy’s first U.S. onshore wind project at Scioto Ridge in Ohio is targeted to start full construction in early 2019. The K&L Gates team advising innogy Renewables US was led by partner Andrea Lucan, assisted by partners David Benson, Sang-yul Lee, Karrie Diaz, Will Keyser, William Holmes, David Hattery, Elizabeth Crouse, Steven Hill, Charles Purcell, James Lynch, and Alyssa Moir, and supported by associates Mark Hammes, Nolan Thomas, Virginia Chiao, Ben Tejblum, Erica Bakies, and Tad MacFarlan. The cross-office, cross-practice team included lawyers from K&L Gates’ power, labor, employment and workplace safety, employee benefits, tax, environment, land and natural resources, international trade, and corporate/M&A practice groups from the firm’s offices in Orange County, Seattle, Chicago, Washington, D.C., Portland, Los Angeles, and Harrisburg. Join us for an engaging afternoon of discussions on policy, technology, and legal hot topics in the renewable energy industry. Panelists representing perspectives from power producers, power purchasers, energy investors, utility, and the legal industry will discuss the role of competitive markets in the renewable energy sector, the impact and increasing presence of renewables and storage on the grid, and renewable project development issues and opportunities with a focus on the Northwest. The workshop is presented free of charge to NEBC members and all interested parties.